A well-maintained heater will be a lot less likely to require repairs in the winter, when you need it the most. There’s not a lot worse than calling in a technician in the middle of a cold winter evening and hoping that they happen to be available, and then having to wait when you find out they’re out on another emergency service call. The adjustments our technicians make during your maintenance appointment can help reduce wear and tear, which is why we advise that you schedule this service as early on in the season as possible (but so long as you’re doing it once a year, that’s more important). Maintaining your heater now means that when winter comes, you’ll save money. Heater maintenance enables your system to run more smoothly than it might have otherwise. Cleaning the burner, for instance, allows for a smoother start-up, and your heater won’t require so much energy to operate. You might be surprised by just how much you save when you have your heater regularly maintained. Studies show that heaters which receive routine tune-ups typically last longer than those that don’t. You will likely need to pay for a repair here or there following up a maintenance visit, but in the long run your heater will work more effectively and efficiently as a result, allowing it to reach the end of its expected useful service life. Are you using a gas-powered heater? There is a risk involved. True, today’s heaters are designed and built with customer safety in mind, but the only way they can remain safe throughout their years of use is if they are well maintained. A gas furnace that doesn’t get regular maintenance, for instance, might have a cracked heat exchanger that is allowing carbon monoxide gas into your home. Cracks aren’t typically visible to the untrained eye, but can occur due to the temperature fluctuations and wear and tear over time. Exposure to this gas can lead to serious illness, or worse, and is nothing to be ignored or neglected. 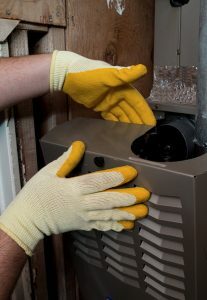 Even if safety is the only reason you have maintenance done for your gas heater, that’s good enough!